China Post issued a set of four special stamps featuring Four Landscape Sceneries as well as a souvenir sheet, namely Spring Scenery, Summer Scenery, Autumn Scenery and Winter Scenery, with a denomination of 10 yuan (1.465 U.S. dollars), on August 4, 2018. The Four Landscape Sceneries were painted by Liu Songnian, one of the Four Masters of the Southern Song Dynasty (1127-1276), using ink and pigment on silk. They are 40 cm in length and 69 cm in width, and part of the collection of the Palace Museum, Beijing. 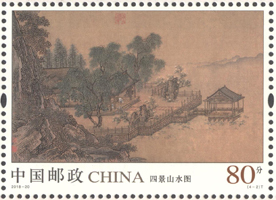 The set of stamps features spring, summer, autumn and winter sceneries. The colors are in keeping with the individual seasons. They are considered masterpieces by Liu Songnian, which combines Jiehua and the seasonal landscapes perfectly. Jiehua, or boundary painting, draws on community palaces, pavilions, houses and other buildings as a theme and is the accurate depiction of architectural forms with the aid of a ruler. The Spring Scenery features a manor along an embankment, where peach and plum trees vie with one another in the splendor of their blossoms. The willow trees are shady and the mountains are misty, all of which show that spring is in the air. The Summer Scenery shows a lakeside pavilion, in front of which the lake shore is embellished with flowers and trees. The pavilion extends into the lake. It has the charm of the Bai Causeway of the West Lake. In the picture, a master sits in the atrium and enjoys the view, with a servant standing beside him. The Autumn Scenery displays leaves of an old tree turning red and purple after frost. A courtyard is fringed with trees and stones, and a bridge leads to serenity. In the courtyard, the windows are bright and clean. An old man sits alone and restores his spirit. There is a servant fetching water and cooking tea for him. The Winter Scenery focuses on a lakeside courtyard house. At a distance there are straight pine trees. Bamboos, mountains, stones, roofs and the ground are covered with snow. At the end of a bridge, an old man is riding a donkey with an umbrella in hand. A servant leads the way for him. They go over the snow in search of plums, looking leisurely and comfortable. 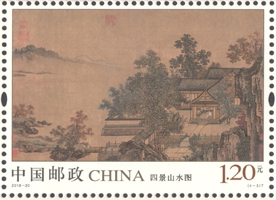 This set of stamps was designed by Wang Huming, vice chief designer of the Postage Stamp Printing Bureau (PSPB) of China Post Group, and printed by Henan Post Printing Factory using a woodblock overprinting process. Offer for sale: This set of stamps is available at designated postal outlets, the online philatelic shop of China Post (http://jiyou.11185.cn), China Philately mobile client and the China Philately Wechat Mall since they were issued on August 4, 2018. This set of stamps will be sold for six months.